It’s rained a lot in Maryland this year. Actually, that’s a bit of an understatement. By several estimates, it’s on track to be the rainiest year ever recorded. In places where 40 inches of precipitation is the annual average, 2018 has deluged us with upwards of 60 inches. It’s been enough to test the waterproofing and humidity controls of even the best-laid homes. You’ve probably noticed. We’ve seen homeowners who haven’t had issues in 20 years suddenly confronted with basement leaks or burgeoning mold problems. There’s a lot that goes into those things, certainly – foundational issues, basement waterproofing, or roofing issues, to name just a few. But one important factor in humidity control that isn’t considered as often as it should be is the HVAC system. Heating and air systems play a big role in maintaining proper humidity levels in a home. When an HVAC unit isn’t sized correctly, humidity levels can be off, and that can lead to mold problems, or, conversely, to overly-dry air. Here’s why bigger isn’t always better – and why maintaining humidity levels in a home through a properly-sized HVAC system is so important. Absolute humidity, or the mass of water vapor divided by the mass of dry air in a volume of air at a given temperature. Relative humidity, or the ratio of the current absolute humidity to the highest possible absolute humidity. 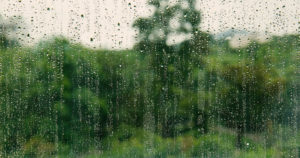 At 100% relative humidity, the air can hold no more moisture, and droplets form. Dew point, or the temperature at which 100% relative humidity is reached and droplets form. Generally, indoor environments should be kept between 40-50% relative humidity. Too much humidity, and people will sweat, papers will go limp, and mold will bloom. Not enough humidity, and heat won’t be retained, especially in the winter. Since temperature and humidity levels are interrelated, HVAC systems have a major impact on humidity levels. It makes sense, but it’s not necessarily obvious – and for homeowners, it can sometimes come as a surprise to find out that 70 degrees on the thermostat feels more like 80 degrees due to humidity. The good news is that AC systems are actually designed to take water out of the air as they function; it’s an important part of maintaining a comfortable environment. That’s why they require drainage. It works because water droplets coalesce as air cools, just as condensation happens when a cold soda sits out in warmer air. When air conditioners run hot air over cool coils, the process removes water from the air and decreases relative humidity. The longer the air conditioner runs, the more water is pulled from the air. During colder months, heat also tends to reduce humidity. That’s because warmer air has a lower relative humidity, all other things being equal. Of course, humidity levels also tend to drop in the winter, and homes that are poorly insulated acquire dry air as it leaks inside. In these cases, the end result can be a humidity level that’s uncomfortably low, resulting in chapped lips or dry skin. So, all of that to say: why do poorly-sized HVAC systems lead to mold problems? It’s because they control the temperature of the home too quickly. For many homeowners, a primary concern is whether rooms are actually being cooled. They may fall into a poor fit thinking that it’ll help coverage in certain rooms or areas. But, while oversized AC units can certainly cool home temperature adequately, they complete the task so quickly that only a limited amount of water is pulled from the air while they function. The result is a temperature that looks good on a thermostat but feels muggy in practicality. And, the humidity leads to worse things, too: mold problems. Ideally, an AC unit should kick on for a minimum of 10 minutes when cooling happens. This will give it time to run enough air through the system to ensure that proper humidity is maintained. Thanks to the rain and humidity in Maryland this year, many homeowners found out the hard way that their HVAC units were poorly sized. If a system was even slightly off, this was the year that revealed it. Fortunately, there are steps that can be taken to maintain proper humidity in your home. For cooling units, incorporating a dehumidifier into your system can help. These help to remove water in tandem with the AC unit, allowing greater control over humidity and temperature all at once. In some situations, reducing the load of the AC unit may be a necessity. On the heating side of the equation, incorporating a humidifier can help, too. These can also be installed to work in tandem with existing systems so that proper humidity levels are maintained during the upcoming dry winter months. No matter what your humidity concerns are, we’re here to help. Your comfort is our priority, and your safety is, too. You shouldn’t have to deal with unhealthy levels of humidity on either end of the spectrum. Get in touch with us, and our expert technicians will help to diagnose your indoor environment issues and identify the solution that will work best for you. Don’t let humidity get out of control. Give us a call instead. Our promise, always, is that you can trust your home to us.